UPDATE: Try Form Designer video course to create fantastic Submit Button styles! Did you know that green and blue are the most relaxing colors? That's why they're used by the most popular websites out there to help users feel good surfing those websites. Submit buttons in web forms should also feel right because that's where people share their most sensitive info. With this guide, you're going to learn how to customize your submit buttons so you can make your visitors feel good when sending their info & increase your conversion rates. 2. 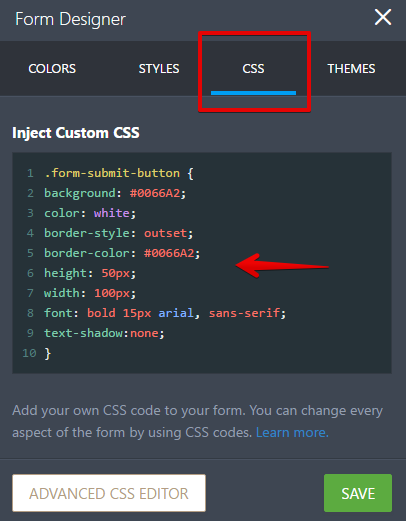 Go to "CSS" tab and paste the following CSS code or your custom CSS codes. .form-submit-button - Selects the submit button on your form. background - Sets up the background color behind the text. color - Determines the color of your text. border-style - Sets the style of your submits button borders. border-color - Sets the color of your submit button borders. height - Sets the height of your button and is indicated with pixels. width - Sets the width of your button and is indicated with pixels. font - Sets the font properties. NOTE: Do not forget to add semicolons (;) after each property. Follow the steps on changing your submit button as above. The only thing that changes is the code. .form-submit-button:hover - This is the class when the mouse is hovered on to the submit button. Every other field is left the same except the background to show what's happening on mouse hover. border-radius - Rounds the corner of your submit buttons. box-shadow - Sets a shadow for your submit button. text-shadow (not applied to example) - Sets a shadow for the text inside your submit button. How'd you do? Please share your thoughts or suggestions in the comments section below. Hi, Could you tell me how to apply CSS3 to make the colour slide up the button when hovered over? Does this feature depend on the form? I use a card form and the form designer only shows "Themes" and "Individual" where I can set some (not all colors) but no CSS. its not working now wht should i do??? Hi there, I'd like to have a spacing/padding around my su_button, so that the buttons are more on their own instead of attached to eachother. What code do I have to use? height, padding-bottom only give me higher buttons, but I just need more space around it. You might find you need to add the CSS !important in order to get some of your CSS to operate. How do you get it to acctually submit though? Is there a way to change the design of the browse button on the file upload option? 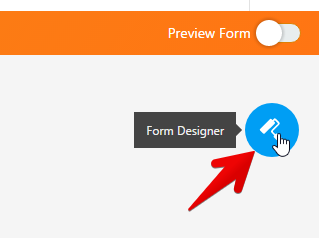 Why is my form not having Submit button? How to add image in place of submit button? Multiple submit buttons useful ?